PHOTO CREDIT: System 4 Productions Inc. Secure a flower in The Max Tanenbaum Healing Garden with a gift of $1,000 and dedicate it to a loved one. If you would like to make more than one dedication, then you may secure multiple flowers; each flower can be dedicated with a donation of $1,000. The Healing Garden is a display of honour, hope and healing and is a tribute to the many loved ones who have been affected by cancer. Every flower helps us to continue making advancements in patient care at Princess Margaret Cancer Centre and carry out our mission to Conquer Cancer In Our Lifetime. There are a limited number of flowers available - To ensure that you are a part of this beautiful display, please make your gift today. You can also call (416) 946-4451 to secure your flower over the phone. Send a message of love and encouragement to people living with cancer. The challenge was to create a natural and beautiful space without using live plants in order to ensure a pleasing, year-round, no-maintenance garden on the 14th floor atrium of Princess Margaret Cancer Centre. In response to this challenge, came the design from Janet Rosenberg and Studio. The Janet Rosenberg and Studio design uses the strong, cultivated patterns of formal French gardens and incorporates the artistry of hand-blown glass flowers, enclosed by an artificial boxwood hedge. The vertical walls feature decorative panels that add another visual dimension and unify a garden rich in colour, creativity and natural forms. 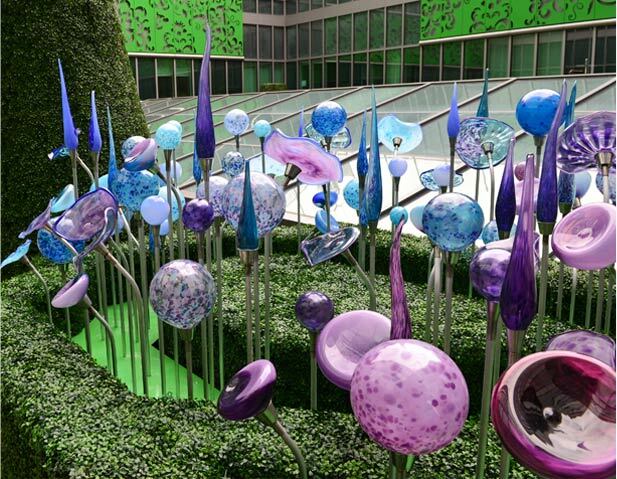 The hand blown glass flowers have each been created to blend together in a colourful garden that resembles a rainbow; red, orange, yellow, green, blue and purple are all represented in the garden with flowers that carry one colour or a blend of multiple colours and tones.